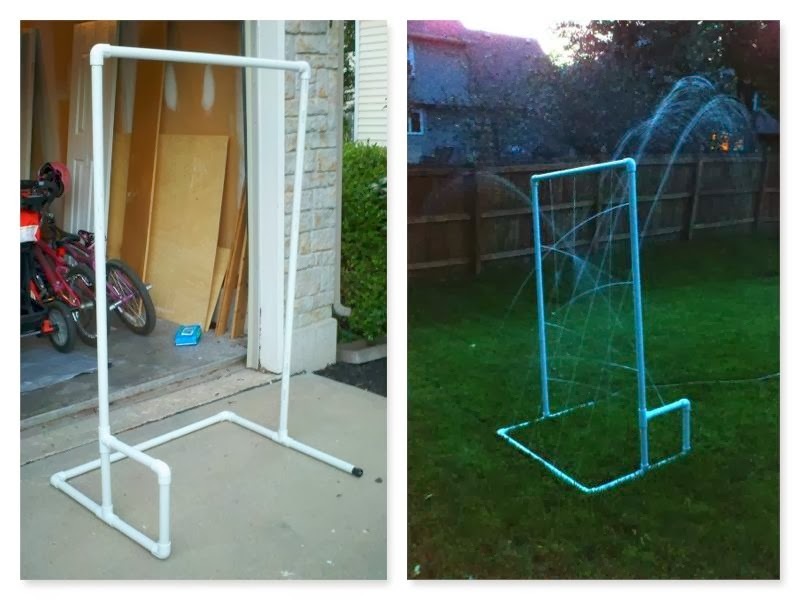 Yesterday afternoon Ashley sent me a Pinterest pic of a DIY sprinkler she thought would be fun for the kids to run through. It was a simple square made of PVC pipe that was put on the ground and then had holes drilled into the top of it. I liked it but I thought it needed a bit more. I started to do some searching on my own and ran across another one that was like a “car wash” that the kids ran through. I decided to combine the two and this is the end result. I had most of the materials on hand from a Halloween costume I made the previous year. I did have to buy another stick of 1 inch PVC pipe, two 90 degree elbows, and the adapter for the hose. Total new cost was $6 dollars. Like most projects, I didn’t get any pics taken while I built it. I always forget until the end. Oh well. Hit me up in the comments if you have any questions.